West Covina motorcycle accident lawyer, Lem Garcia, provides information on what to do after an accident. Motorcycles are fun to ride, but they can also be dangerous to yourself and other people on the road. Motorcycle accidents frequently cause minor and serious injures, which is why it is important that you know what to do when you’re involved in a motorcycle accident. There are several things that you should do after a motorcycle accident in order to protect yourself from legal liability and ensure that you are properly compensated for the damage that you and/or your vehicle sustained. Being in a motorcycle accident can be scary and overwhelming; adrenaline may kick in and you may feel like the only thing you want to do is leave the scene immediately. However, you should try to remain as calm and rational as possible. Get to the side of the road and take pictures of any damage and injuries. If you are physically able to, get safely to the side of the road as quickly as possible. Assuming that you are not seriously injured or require emergency medical care, the first step you should take after being involved in a motorcycle accident is to take pictures of both the scene and of all of the vehicles involved. You should also take pictures of any injuries that you suffered, however minor they may be. Pictures of the scene, damage, and any injuries will help preserve evidence should the accident progress to a lawsuit and will assist the lawyers in determining liability and other legal issues. Trade information with the other party and talk to any witnesses. You should also trade driver’s licenses and insurance information with the other party involved, regardless of who is at fault. In fact, the law requires you do so if the accident results in potential property damage or injuries exceeding $500.00. However, when exchanging this information with the other party, make sure that you do not admit fault or apologize; such statements can be detrimental for you in the case of a lawsuit. Also, if time permits and this is applicable to you, take some time to talk to witnesses who saw the accident and get their phone numbers. You can give this information to the police or your lawyer in the case that a lawsuit results from the accident. Verify police officer’s incident report. If the accident is serious enough to warrant police or CHP presence, talk to the investigating officer and ensure that the information that the officer has written in his report is detailed and factually accurate. The report that officers write in the case of serious accidents can prove to be particularly helpful should you need to negotiate with an insurance company later. The accuracy of such reports will also be essential in the case of a lawsuit or trial. Lastly, to increase your chances of receiving your maximum settlement amount from the other party or their insurance company, contact a motorcycle accident attorney’s office to ask them any questions or discuss possible representation. Attorneys handle many of these cases all the time and know how to handle your case from start to finish. If you choose to file a lawsuit, make sure that you do so in a timely matter in order to avoid violating any statute of limitations. Remember, motorcycles pose a variety of hazards to other people on the road. Motorcycles are harder to see on the road and easily hidden by cars, they are more susceptible to crashes caused by debris and small objects on the road, and are less stable than cars because they only have two wheels. Any one of these factors can contribute to a motorcycle accident. 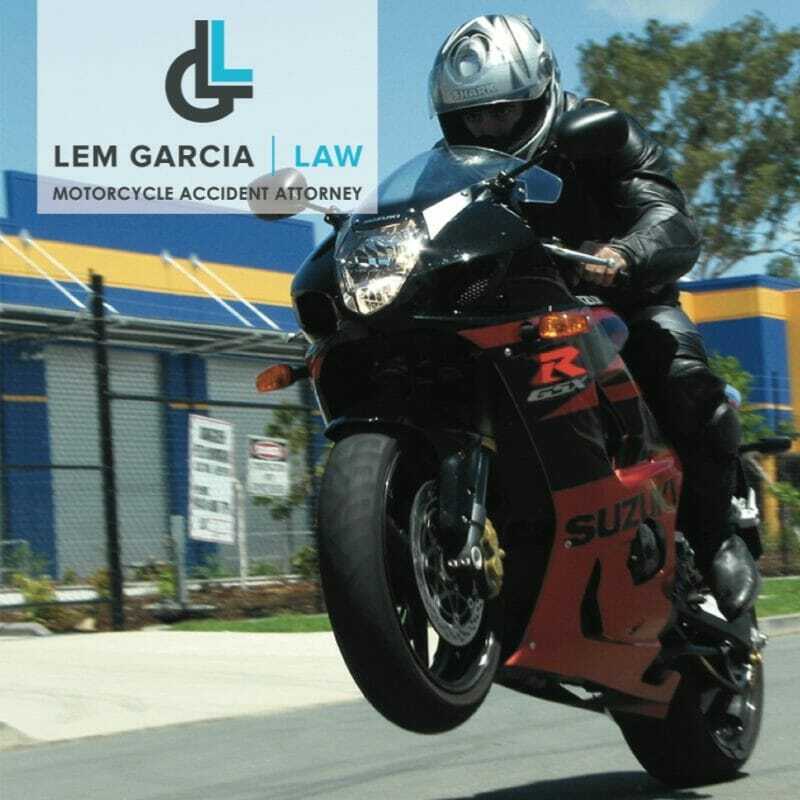 West Covina motorcycle accident attorney, Lem Garcia, can help. If you or someone you care about has been injured in a motorcycle accident from the negligence of others, give West Covina Motorcycle Accident Attorney Lem Garcia a call. His number one goal is to get you the maximum compensation for your case. Call (626) 337-111 or text (626) 252-2168 anytime.